Born 12th October, 1932, Yuichiro Miura (Japan), must surely be one of the originators of this particular extreme sport – extreme skiing. On 6th May, 1970 he became the first man to ski down Everest. With a fighter pilot’s helmet complete with a transceiver on his head, skis on his feet, oxygen tanks and a parachute strapped to his back, Miura launched himself down Everest’s South Col from an altitude of 26,000 ft to ski and slide approximately 4,200 vertical feet. It took about 2 minutes and 20 seconds. No-one knew whether the parachute would open at that altitude. In fact it did open but was virtually worthless and Miura struggled unsuccessfully to control his speed. He eventually lost his footing and slid uncontrollably towards the world’s largest crevasse (bergschrund). These were the days, remember, when the skis were attached to your legs with bindings so they slid with him, tumbling and turning until one eventually snapped off. His dramatic slide was brought to an end just 250 ft from the edge of the crevasse when he hit a small patch of snow and miraculously halted. I remember seeing the film “The Man Who Skied Down Everest” years ago and it left a lasting impression on me. If you ever get the opportunity to watch it then do so… it was filmed in 1975 and won the Academy Award for best documentary, the first sports film to do so. He became the first person to ski down Japan’s Mount Fuji in April 1966 and it was here that he first deployed a parachute in the hope that it would slow down his velocity. It worked and he successfully lived to tell the tale! Later in the same year he skied down Mount Kosciusko, the highest peak in Australia and followed this up, in 1967, with a successful descent of Mount McKinley, the highest peak in North America. New Zealand’s Tourism Bureau invited him to ski the Tasman Glacier and it was here that he met Sir Edmund Hillary. “Sir Edmund Hillary was my superhero,” Miura says. “When I listened to his Everest summit, I determined my target to be Everest, too.” After the shock of someone contemplating skiing Everest wore off, Hillary encouraged him. 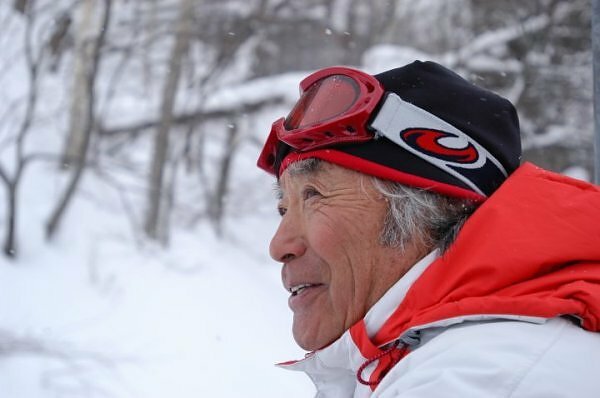 “He inspired me to be an extreme skier who can make history,” Miura says. The project was as much a scientific expedition and it was an extreme skiing adventure. It took 800 porters to carry 27 tons of equipment to the Everest base camp, a 185-mile, 22-day journey that began on March 6, 1970. He was 37 years old when he became the first man to ski down Everest and the fact that it very nearly cost him his life did not put him off his extreme skiing adventures. In 1981, he skied Africa’s Mount Kilimanjaro, and in 1983 he became the first person to ski Antarctica’s Mount Vinson. In 1985, he added Russia’s Mount Elbrus and Argentina’s Mt. Aconcagua to his list. Besides being the godfather of extreme alpine skiing, he is also an indomitable climber who in 2003, at the age of 70 years and 223 days, became the oldest person to reach the summit of Mount Everest. This record was later broken. However, on May 26th 2008, Miura once again successfully summited Mt Everest at the age of 75.
congratulations ,Mr.Miura,for your whole activity.